Astrophysicists have found a star-like object with a surface temperature just one tenth that of the Sun. The cold object is known as a brown dwarf: a “failed” star that never achieved the mass required to begin nuclear fusion reactions in its core. This one – called J0034-00 – is thought to have a surface temperature of just 600-700 Kelvin (up to 430C/800F). It is the coldest solitary brown dwarf ever seen, according to the British team that discovered it. This find further tests the boundary between high-mass gas planets, like Jupiter, and the smallest brown dwarfs. “Physically, stars, brown dwarfs and the gas planets are all the same thing – they’re just blobs of gas with different mass,” said Dr Steve Warren, of Imperial College London, who led the project. 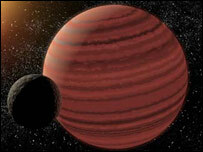 The brown dwarf was first spotted by his colleague Dr Daniel Mortlock. “Identifying an object like J0034-00 is a more challenging version of finding a needle in a haystack,” he said. 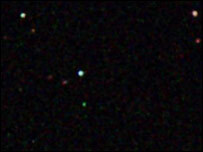 J0034-00, found in the constellation of Cetus, is a relative lightweight. It has a mass of just 15-30 times that of Jupiter and a similar diameter. It was spotted in the early stages of the world’s deepest ever near-infrared sky survey – using the UKIRT telescope in Hawaii. Using four filters, the telescope produces 2,000 images a night – a vast amount of material to sift through. The reason for the filters is to get an idea of the colour of objects in the sky. Dr Mortlock had been looking for distant quasars when he found the brown dwarf. “One of the interesting objects that turned up there didn’t have quite the right colours for a quasar, and that was J0034-00,” he said. “The peculiar thing was it was a billion times nearer than the quasars we were actually looking for, and it looks almost identical in terms of the colours,” added Dr Warren. More observations, made at the Gemini South Telescope in Chile, were needed to work out its temperature and likely mass. It is still too early to say exactly how far away it is from Earth, but the research team believes it could be about 50 light-years. And that is not so far, compared with the distance from some of the stars that can be seen with the naked eye. Which Telescope Should I Buy?